Personal blog of Loh Chuan Tuck, the critical and obnoxious Malaysian who loves to preach. Ready to collaborate with SMEs to generate productivity. 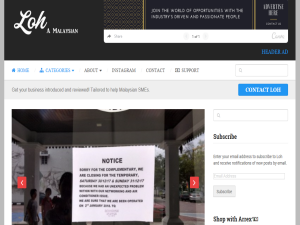 This what your Loh A Malaysian Blog Ad will look like to visitors! Of course you will want to use keywords and ad targeting to get the most out of your ad campaign! So purchase an ad space today before there all gone! It was before Christmas of 2018. It was 5am in the morning. It was dark. I wished to head into the North-South Expressway (PLUS) but I missed the exit. Next,... The post I finally get my Fiesta back! appeared first on Loh, A Malaysian. Greetings “Good day” has been my daily greetings since I started to use it back in New Zealand. My colleague knows that it must be me when they hear it... The post Good day, Malaysia! appeared first on Loh, A Malaysian. If you are the owner of Loh A Malaysian, or someone who enjoys this blog why not upgrade it to a Featured Listing or Permanent Listing?